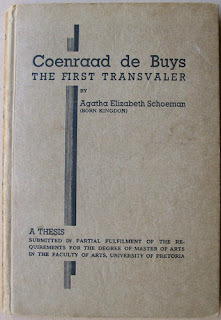 The book (which is a little worn on the spine and even signed by Agatha in pencil) was actually a thesis "submitted in partial fulfilment of requirements for the Degree of Master of Arts in the Faculty of Arts, University of Pretoria". 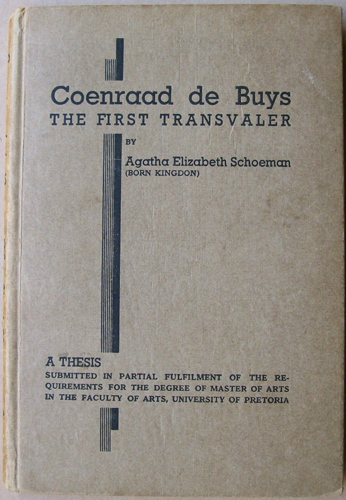 It covers the life and times of Coenraad De Buys and and been used by many researchers because of it's historical accuracy and it's insight into daily life in the colony. I have been trying to find out who, if anyone, has copyright on the book as I would like to make it available electronically as a searchable PDF file. If anyone can help with regard to copyright on the book or knows of Agatha's descendants I would really appreciate your help! Well done 5x grandson, I am very proud of you. This looks like it could become a collectors item sooner than later. You are really doing a great job on the "de Buys" family history, keep it up. To the best of my knowledge copyright in South Africa lasts for 50 years unless specifically renewed, so whoever did hold copyright on this most likely no longer does. In any case I wonder if anyone would object to this being made widely available now? The Dept of History at Tukkies would maybe be best placed to advise on this. © 1933 University of Pretoria. All rights reserved. The copyright in this work vests in the University of Pretoria. No part of this work may be reproduced or transmitted in any form or by any means, without the prior written permission of the University of Pretoria. My father-in-law is a very keen follower of transvaal history and is eager to find a copy of this book. Can I download it anywhere? Yes, the book is available at the University of Pretoria's website. Visit this page: http://upetd.up.ac.za/thesis/available/etd-04062011-162438/ and download "dissertation.pdf" on that page.